Write an article titled "Mirror iPhone XS/XS Max/XR's Screens to JMGO N7L Smart Projector to Make the Big Screen A Lot Bigger "
1. 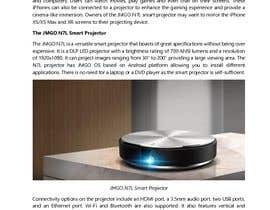 Explain ways to mirror Apple's new iPhone XS/XS Max/XR screens to the JMGO N7L smart projector. Note: JMGO N7L is a 1080p portable projector powered by Android OS, and you can make a Google search to study the features of the JMGO N7L.